DeadMalls.com is celebrating a decade of recording the death rattles of American shopping malls. Chronicling the nasty and brutish lives of malls throughout the fifty states with pictures and anecdotes, the site launched in 2000 and celebrates its first ten years next month. It seems a remarkably appropriate tenure. Hard numbers documenting the decline of the American shopping mall are hard to come by. 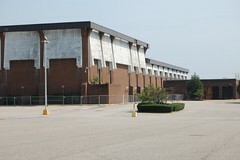 (Anecdotal and pictorial evidence, like this remarkable photo essay of defunct shopping malls, are much more accessible.) The phenomenon of mall death received robust coverage in magazines and newspapers and on television over the past 18 months. The Newsweek piece linked above cites the International Council of Shopping Centers, which reports that one-fifth of the nation’s largest 2,000 malls were failing. Its current number broadens that significantly – to 102,000 shopping centers of all size. This is much more in line with the widely-cited number from a 2004 Dallas Morning News article, claiming that the nation hosts 46,990 shopping malls and shopping centers. Wikipedia, meanwhile, has a list of shopping malls in the United States containing a modest 868 locations. It also notes that much of the fluctuation results from competing definitions of what constitutes a mall; we can assume that similar uncertainty exists as to what constitutes its death. Some part of any decline, to be sure, is a function of the economic environment. The Journal article above, for example, graphed declining mall sales during the recession, painting a clear picture of impact. The recession, though, isn’t to blame. It made an existing trend worse. In a piece from two years ago, The Economist detailed the numbers behind that trend. Nearly no new indoor shopping centers in the latter part of this decade. A 50% drop between 1997 and 2002 in the percent of all retail sales occurring at malls (from 38% to 19%). What once was a mecca became mainstream. And then, this decade – moribund. This week, while visiting in-laws, I went to a mall in Visalia, deep in California’s agricultural Central Valley. For several hundred yards in any direction from the mall’s doors were the ubiquita of American suburbia (big box stores, fast food chains, roads and parking lots); beyond, in at least two directions, the orchards and fields that bring income (and air quality problems) to thousands of local residents. The Visalia Mall doesn’t exist in New York City. It’s what malls often used to be – a commercial and community focal point whose tribulations and triumphs are common knowledge. At the mall are diverse shops that, while common on Manhattan’s streets, are too small for a big box location and need more traffic than a strip mall provides. Chains that would do fine on Madison Avenue would fail completely on Mooney Boulevard, the mall’s home, outside of the sheltering collective within its walls. At the mall, smaller chains and local stores survive in symbiosis; picking customers off the main thoroughfares like birds on a hippo. This mall still exists, in large part, because of unique features of the community. High-speed connections are commonly unavailable, and economics and culture vastly reduce the importance of the Internet. More than anything else – more than the economy, than shifting demographics – what’s gutting American malls is the Internet. Malls are retail newspapers. They are professionally curated assemblages of commercialism, vulnerable to simple tools that get the job done more specifically and rapidly. Nowadays, it’s far easier and more personalized to fulfill a shopping list online, putting together your own virtual mall from which you buy only what you’re interested in, skipping over the online equivalents of Cinnabon and the sunglasses kiosk. Even as newspapers are more and more relegated to niche markets, so too are malls. The blossoming of the Internet in the Aughts, a time of political and economic instability, has hastened (though not completed) the demise of many cultural components tangential to its core functionality. The slow sublimation of newspapers is understood to be its victim; the evaporation of malls, America’s once dominant retail touchstones, is not. Both industries are sliding down similar slopes, pushed by the same hand. 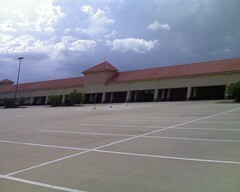 In ten years, after the DeadMalls.com domain has likely been allowed to lapse, retail centers will look very different than they did ten years ago in all but a few instances and locations. Visalia, still a place dependent on the core industries of the 19th century, may continue to be the exception to the rule. Its likely, though, that its newspaper and mall will join the horse-drawn plow and hand-picking walnuts in the gallery of systems once admired; now superseded. The lesson is simple: the goal never changes, though the path to achieve it often does. For decades the goals of community and convenience were met by shopping malls. That’s simply no longer the case.